A while back a friend and fellow blogger asked me an intriguing question: would I be willing to join in a collaborative project sharing reviews of favourite classroom/teacher use apps? Firstly, I was honoured to work with this stellar group of reflective educators, my PLN who constantly help me go further on my joyful-learning journey. Secondly, I have several go-to apps I use with students daily, so I had a few ideas of what I might share: first apps any new user should try, documentation tools, or my personal favourite. I went with that last category, thinking about how my students and I share our learning: families and other followers see our vines like this one daily on our class twitter account Beyond 4walls @FynesKs. 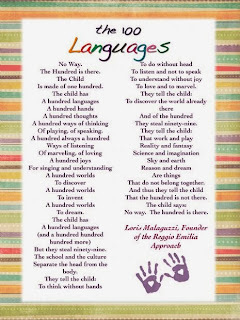 Please find links for all the wonderful "coll-APP-orative" posts listed at the end of this post. We hope you'll visit each blog and perhaps leave a comment, too. *Note: in order to stop and start the vine clip, simply tap (touchscreen) or click (desktop/laptop) on the clip. I have a confession to make: I am addicted to vine. Not vines, not wine, vine. It is my go-to app when looking to share a snippet of student learning. While I've only included at few vine clips in past blog posts, due to cross-platform embedding issues (e.g., youtube clips show up on desktop but appear as large blank when viewed on some mobile devices), I was delighted to find that I can embed vine clips that are visible across various platforms. 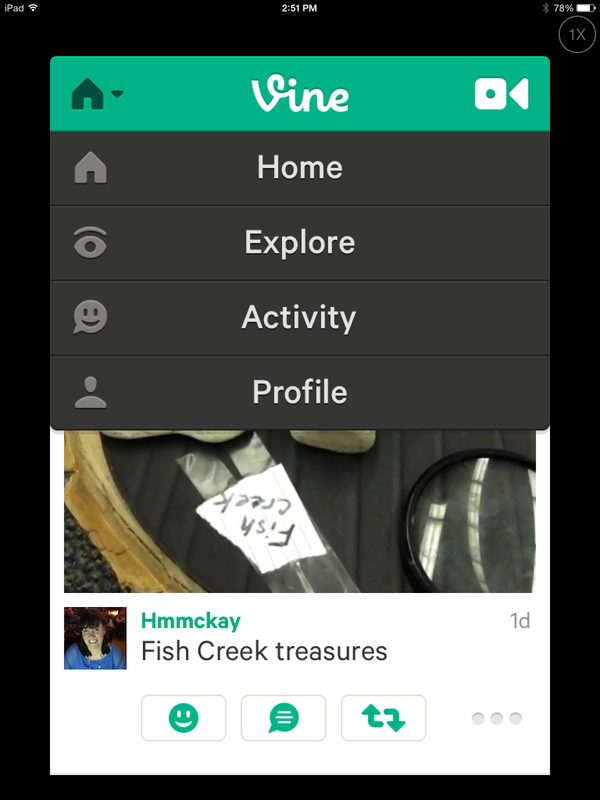 Please note, however: on some devices the vines open in "mute" mode (as seen in picture below). Simply click on the red x beside the speaker icon (upper left) and you will have sound. 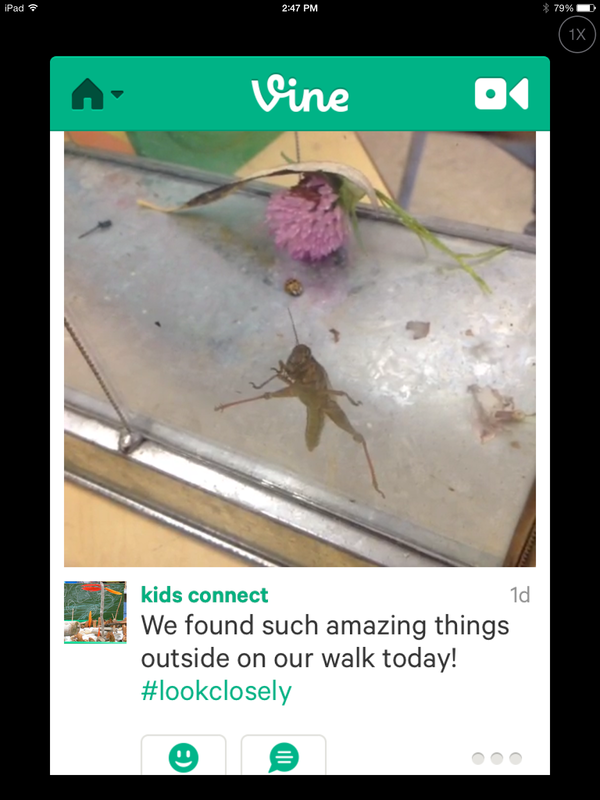 ﻿﻿ A little bit about why I love vine: it is a simple but powerful way to share glimpses of life. 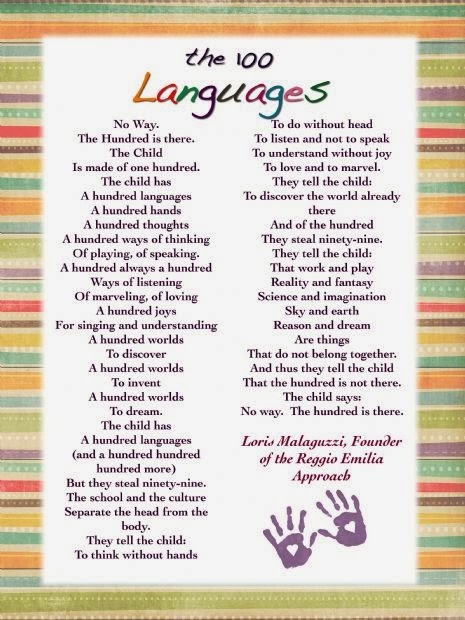 I am inspired by Reggio Emilia and the works of Loris Malaguzzi, and often think of his famous poem "the 100 languages of children" that so amazed me the first time I read it. Because early learning, indeed all joyous learning, is so multi-faceted, it makes sense to me to capture both the sights and sounds of exploration in all its forms. In the classroom, this looks like noticings and wonderings, provocation and response, or little moments of music, art or poetry, new experiences, discoveries shared, thank-you's, even student how-to movies. Outside, we capture our noticings, and simply send them once back in wifi range. Vine is a "capture" app, meaning you don't use it like some other picture or video supporting apps (such as pic collage, which allows you to use pictures from a variety of sources) but instead capture the current moment, in six-second snippets. In the year or so I've been using vine, I've delighted at the way the touch-screen operation allows for simple stop and start recording, while simply turning off the app saves the creation at the point of closure. Stopping and starting allows for some very creative storytelling, as a quick vine search for "stop motion" will show. New innovations to the updated app now include "time travel" and sessions, which allows you to stop recording a vine, save the partial clip for later, and record up to seven new vines at the same time (this news made my jaw drop with the inherent stop-motion possibilities it offers). Note: due to the large number of vines included in the post, I have chosen to leave them as links within the text (thus all brown text is active, will open in new window) to minimize the size of this post. My treasured vine badge, hand-made by Tina Z. 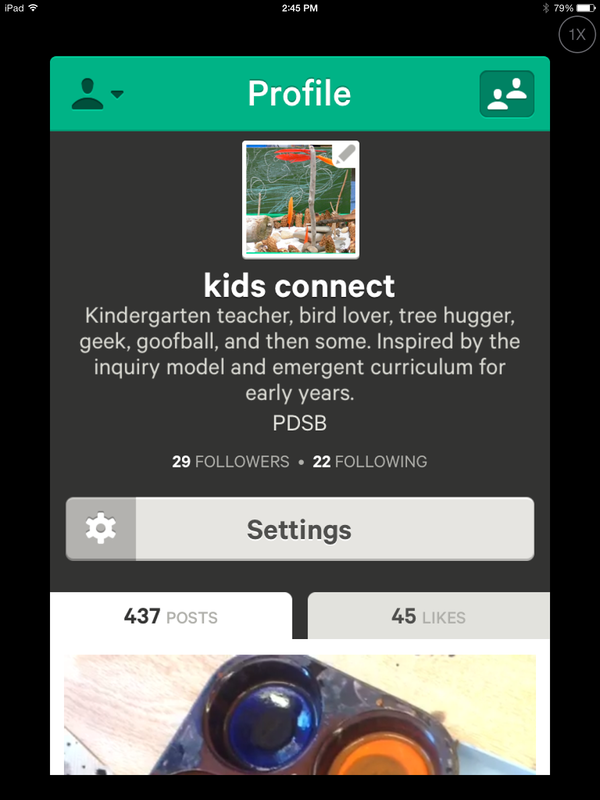 ﻿ I've been thinking about writing a post about vine ever since participating in the social media cafe at the "Teaching and Learning in a Digital World" conference held by the PDSB back in August. Here's a test I made while teaching someone how to use the app. A colleague and friend Tina Zita (see below for link to her post; Tina is an ITRT in our board, an ever-enthusiastic early-adopter, and one of the conferences coordinators) asked me if I'd be willing to join the social media cafe to help share my love of apps that work in concert with twitter to help make learning visible. When she suggested I share "vine" I agreed. Somehow by the end of summer I was also co-presenting a digital documentation session with two PLN friends and fellow PDSB kindergarten teachers, Emily Krahn and Helen Chapman. When asked to present on using technology to support emergent curriculum documentation, I was at first resistant to share my limited experience. I was delighted when Emily and Helen agreed to join me, as our workshop preparation turned out to be a wonderful opportunity to learn in-depth what we were all interested in using but hadn't yet explored in depth. This sort of thing happens to you when you hang out with Tina, she does inspire people to push their professional boundaries very well. Note: if you are interested in what we shared during our "Making Learning Visible" session, our bitly bundles created for that workshop can be found here, here, and here, and a first vine made with Stephen, a Kindergarten teacher in Mississauga. If you head to the app store, this is the one you're looking for. Note: it's an iPhone app so it won't show up in iPad searches. It works on iPad, iPod too. All this talk about the "why" and "when", now for a little about the "how". Vine is incredibly easy to use. Students co-create vines with me daily, and while I remain in control of what will be "published" or shared with our followers, they experiment with capturing various scenes of Kindergarten life and almost always help with captioning our tweets. Once you have downloaded the app and synched it to your mode of sharing (I use twitter while some send vines to Facebook), you are ready to try your hand at making a vine. In the three pictures below, you will see what you need to begin. Start on the home page (first pic) and select the video camera (icon upper right). 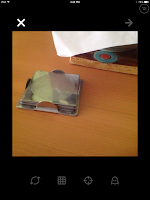 It brings you to recording screen, which you see below (second pic). As you press the image in the centre of the screen, it records, which is shown with a green bar extending along towards the arrow (third pic). Stop touching the screen, recording stops. You may stop and start as many times as you like until the bar is finished, meaning you have completed 6 seconds. Now, if you wish to capture voice or music, you may prefer to record all at once. For moments added together to tell a story, however, tapping the screen as you move (or move the objects of your recording) will have an animated effect. Either way, once you have a completed green bar along the top, you will be able to save for later editing (e.g. time travel) or immediately caption for sharing. I usually advise going straight to caption, and getting used to vine, before trying the newer editing features, but I am a firm believer in playing to learn so please just have fun and experiment! Once the recording is complete, you may add a caption and then share. Here's what you will see: first, the green check shows you've completed six seconds. You may continue (press check) or return to preview vine (back arrow, top left in first pic). Once you press the checkmark, you'll be taken to the share screen (second pic). Here's where you decide how to share (only vine, twitter, facebook all options) and add the caption as well as location (I do not use) or channel (like youtube, allows others on vine to find your clips by category). The caption acts like twitter, with a character countdown showing you how much text you can fit. My vines are set to post to twitter, as the slider below indicates. Once you click "done" you cannot edit further, only erase. To view, go to your profile page (third pic) and you may scroll back through your vines, as well as those of others you follow (this is as simple as in other social media apps, simply click on a user and select "follow"). Your vine, viewed in the vine app, will simply loop the 6-second clip indefinitely unless you tap the screen to stop play. Tap again, it resumes. The caption appears below the vine (see pic below). 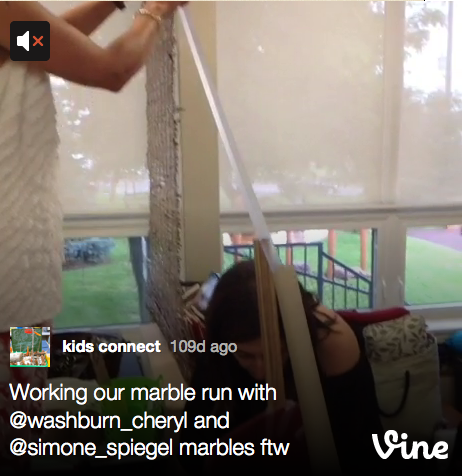 A bit more about "why" vine: it is a wonderful window into the classroom. To my students, seeing what other Kindergarten kids are doing elsewhere is an education in the bigger world around them, and often provides sparks for our own inquiries. 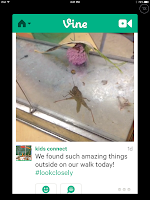 I often share vines with small groups of students when I think they'll be interested, or show the whole class for a conversation about what they see, think and wonder about this glimpse into another classroom. I follow friends of our class (whose classes we also follow on twitter) and we sometimes comment on their clips when they inspire us. We often take photos and vines to share with our friend "Ranger Rob", Peel's outdoor education co-ordinator and my students' favourite teacher from afar (Rob Ridley works at the field centres and board main office when not at schools), especially during the "KindergartenBioBlitz" events on twitter. My students also create vines to answer questions from other classes: one teacher asked how we do the "magic leaf" art, and another asked how we play "Roly-Poly Pumpkin", another let us know how her students were inspired by our bey-blade creations to try some of their own. Last note: this post is merely one of a carousel of app reviews among friends. Here are links for the rest of the app collaborative shared today. Please visit and comment or ask questions! 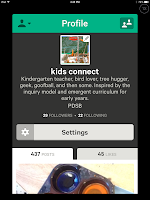 What a great breakdown of the hows and whys of Vine in the classroom. I'm getting more and more fascinated by the 'window into the classroom' phenomena that you, Joanne Babalis, and others are trying out. I could see how Vine would be an absolutely fascinating way to reflect for primary students in particular, as I've noticed they are drawn to the looped imagery. Not only am I going to try vine, your post and another in the blog hop have me thinking about how much fun kindergarten sounds! Thanks for sharing. Thank you Royan and Debbie for your kind comments. I was worried at first how to share a "how-to" without being too technical, not in tune with the tenor of my blog. You both make me feel as though the "why" came across, so I am relieved! Debbie, Kindergarten is good, serious fun. Not cute, not pre-learning, as some have traditionally seen it, but real moments of wonder and joy in small but mighty humans. I wouldn't trade my job for anything. Thanks for sharing! I'm a new follower of your blog.